Look! Up in the sky! Falcon Heavy lifts off. I’ve been watching the SpaceX launch of the Falcon Heavy rocket. They sent up Elon Musk’s personal Tesla Roadster. This booster can lift 64 metric tons (141,000 lbs), more than a 737 jetliner loaded with passengers, crew, luggage and fuel. The Saturn V lifted more… but we’re not using that one anymore are we! I have to admit that I had something of the same feeling that I recall when I was little kid, watching TV coverage of Gemini and Apollo missions. The boosters landed successfully… upright… . Very cool. Sitting in the roadster is “Starman”, visible at after 33:55 along with a strong taste of David Bowie’s Life On Mars. Boosters, side and center core, land at 37:45 and at 38 or so, vibrations screwed up the camera’s antenna on the drone ship. But it landed. 39:50 you get the car again. Speaking of Life on Mars… did you see the British series? There was a sequel: Ashes to Ashes, but it might not be in US format. UPDATE: It seems the center core booster failed. This entry was posted in Just Too Cool, Look! Up in the sky! and tagged Falcon Heavy, spacex. Bookmark the permalink. 10 Responses to Look! Up in the sky! Falcon Heavy lifts off. At 24, Apollo is hidden in the mists of time. I can only imagine how exciting that must have been.. The launch today was spectacular – and those landings were… Well… “just too cool”. 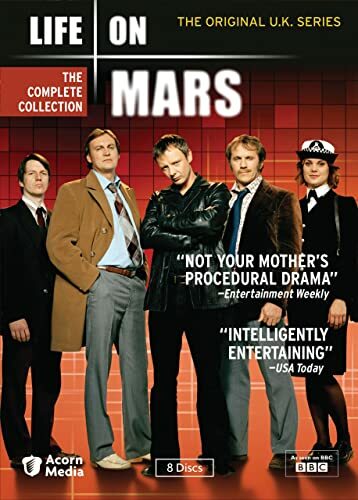 ‘Life On Mars’ was a terrific series! Very original in its concept and hilarious in its execution with some larger than life characters. Best of all? The “details” in fashion, societal mores at the time, the vernacular, humour and grittiness of living in the 70’s. As a teenager in the UK in those years there wasn’t an episode in which at some point I didn’t laugh out, loudly. The US version was just as good it’s a shame the networks pulled it so soon. Yes, at the time “Life on Mars” was first out I did watch it. 2006, or thereabouts. It clashed with choir practice, so I didn’t see it all. It was a sort of homage to the iconic British 70s TV series “The Sweeney” (as in Cockney rhyming slang for the Special Squad: Sweeney Todd, demon barber of Fleet St. etc. etc.) when police were a bit less “restrained”, shall we say, than now in their treatment of “suspects”. Back then, in such innocent times, it was famous for showing all this on T.V., with lots of swearing (but certainly not certain words beginning with “f”) and quite realistic violence. Nothing compared to now, of course but any sentient life-form knew that that was exactly what was going on. Even teenagers like yours truly was at the time knew all that. Yet, it wasn’t felt necessary to reveal everything. Less really was more. The 2006 version was far too heavy on the preachy, knowing, lefty “how sexist they were and how great we are now” vibe. Wonderful, tolerant, put-upon, women versus childish, sexist men. All the usual B.S. propaganda. It descended into caricature, really. The 70s original was realistic, to an extent, but certainly tongue-in-cheek in many aspects, as we all knew, but that just seemed to pass over the makers of the 2006 version. I didn’t watch the second series “Ashes”. Ooops, “Sweeney Todd” = “Flying Squad”, not “Special Squad”. Sorry. Just so incredibly, amazingly cool. There is no other word. Love liftoff, love the boosters coming off, double love the absurd landing, how good do you have to be math and physics to make this all happen. Kudos to all the happy folks! I feel proud and I didn’t do a thing. Which is sad… But 2 outta 3 ain’t bad! No one else has landed a rocket. No one else has landed two rockets simultaneously! SpaceX is LIGHTYEARS ahead of the competition. And I’m one step closer to my dream of attending a Latin Mass on Catholic Colony on Mars. It was very cool to watch! The side boosters synchronized landing was really cool. Unfortunately, the core booster was confirmed to be lost. Some of its landing engines did not fire, it missed the drone ship landing pad, and crashed into the ocean. The boosters landing was the only true innovation in this launch, but crikey an absolutely amazing one !!! The fact that they were able to manage to get 27 separate Merlin engines to work together in harmony is mind boggling. This shows how far advanced we’ve come in computer control The Soviet manned moon rocket (to be), back in the ’70s, used 30 separate engines. They were never able to figure out how to get them to work together, which caused imbalances and eventually booster failure, which doomed their manned lunar program. Watching the live stream (which is now available on YouTube – I watched it again last night) I was slightly taken aback by how young everyone from Space-X is. I guess it’s just a matter of perspective. When I was a youngster, everyone in Mission Control in Houston and Launch Control at the Cape, seemed so old. Fast forward 40 years and now they seem like kids. That double landing was something else, way too cool. Methinks a red convertible cruisin’ through space requires additional music such as Non Nobis Domine, and Ride of the Valkyries (just to let those Martians know that Earthlings are not to be trifled with and it’s best if we all get along).